Ratchet Tie-Down Strap with nylon webbing measures 2 inches wide x 27 feet long with double J-hooks on each end. Rated 10,000 pounds break strength, 3,333 pounds working load limit. 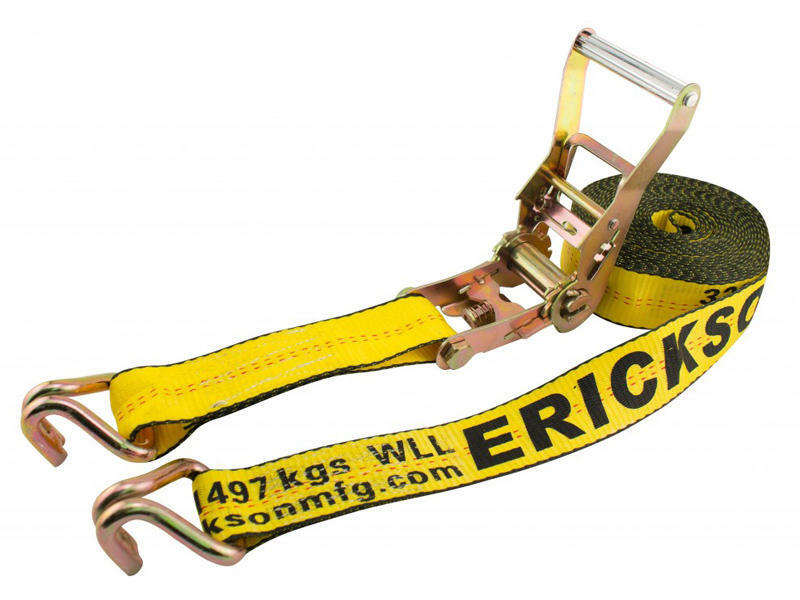 This strap also includes safety tag warnings and is D.O.T. approved. Per federal D.O.T. requirements, working load limit is 1/3 of the rated capacity. What started as a two-person operation in a tiny two-car garage is now a prospering, active, North American leader in Tie-Down Straps, Tow Straps, Loading Ramps and many more securement related products. April 2012 marks our thirty-fifth anniversary in business. We are proud and thankful to have had so many years behind us and look forward to many more. Erickson Manufacturing is a family run corporation with President and Founder of the company Brent Erickson and his wife Connie along with his three daughters, Nicole, Michelle and Crystal. Managing businesses on both sides of the border, our Canadian center, located in Thamesville Ontario Canada houses over 70,000 square feet of manufacturing and distributing facilities and our United States location is an amazing 50,000 square foot distribution center in Marine City, Michigan.